Genomic instability has been reported at microsatellite tracts in few coding sequences. We have shown that the Bloom syndrome BLM gene may be a target of microsatelliteinstability (MSI) in a short poly-adenine repeat located in its coding region. To further characterize the involvement of BLM in tumorigenesis, we have investigated mutations in nine genes containing coding microsatellites in microsatellite mutator phenotype (MMP) positive and negative gastric carcinomas (GCs). We analyzed 50 gastric carcinomas (GCs) for mutations in the BLM poly(A) tract aswell as in the coding microsatellites of the TGFβ1-RII, IGFIIR, hMSH3, hMSH6, BAX, WRN, RECQL and CBL genes. BLM mutations were found in 27% of MMP+ GCs (4/15 cases) but not in any of the MMP negative GCs (0/35 cases). The frequency of mutations in the other eight coding regions microsatellite was the following: TGFβ1-RII (60 %), BAX (27%), hMSH6 (20%),hMSH3 (13%), CBL (13%), IGFIIR (7%), RECQL (0%) and WRN (0%). Mutations in BLM appear to be more frequently associated with frameshifts in BAX and in hMSH6 and/or hMSH3. Tumors with BLM alterations present a higher frequency of unstable mono- and trinucleotide repeats located in coding regions as compared with mutator phenotype tumors without BLM frameshifts. BLM frameshifts are frequent alterations in GCs specifically associated with MMP+tumors. We suggest that BLM loss of function by MSI may increase the genetic instability of a pre-existent unstable genotype in gastric tumors. Cancer is a progressive genetic disease characterized by progressive accumulation of mutations in both coding and non-coding sequences . Simple sequence repeats or microsatellites are highly unstable in some human neoplasms, identifying a class of tumors with the microsatellite mutator phenotype (MMP+) (for review see ). MMP+ve status is defined by instability in more than 30% of analised microsatellites, including at least one mononucleotide (such as BAT26 or BAT25) . Microsatellite instability (MSI) has been described as a frequent genetic alteration in various human solid tumors including sporadic and familial gastric carcinomas (GCs). In almost all patients with hereditary nonpolyposis colorectal cancer (HNPCC), molecular studies have shown that MSI is caused by germline mutations in genes encoding proteins required for DNA mismatch repair (MMR) . Genes such as hMSH2, hMLH1, PMS1, PMS2 and hMSH6/GTBP[5–8], were defined as "caretakers" because, when disrupted, they favor the acquisition of mutations at high frequency in several genes including oncogenes and tumor suppressor genes . However, in a significant fraction of sporadic MMP+ tumors, mutation analysis has not allowed the identification of the genes responsible for MSI [2, 10], suggesting that, in such cases, MSI might be caused by epigenetic mechanisms. In fact, gene silencing by promoter hypermethylation was recently shown for the hMLH1 gene [11–13]. The significance of MSI in tumorigenesis has been supported by the demonstration that the genetic instability characterizing MMP+ gastrointestinal cancers may target short repetitive tracts within the coding region of genes important for cell survival and proliferation. Insertion/deletion mutations were found in the genes for the transforming growth factor-beta type II receptor (TGFβ1-RII), the insulin-like growth factor type II receptor (IGFIIR), the DNA mismatch-repair genes hMSH3 and hMSH6, the proapoptotic gene BAX and the transcription factor E2F-4[14–18]. In all the cases, with the exception of the E2F-4, the nucleotides insertion/deletion resulted in frameshift mutations and protein truncation. Although the biological significance of these alterations is not fully established, it was proposed that the absence of TGFβ1-RII receptors from the surface of gastrointestinal epithelial cells could eliminate the negative growth control of TGF-β, leading to uncontrolled cell growth . IGFIIR has a role in growth suppression by binding and activating the TGFβ1 receptor complex and by mediating internalization, with subsequent degradation, of the growth factor IGF-II [20, 21]. BAX promotes apoptosis and it was reported that BAX inactivation leads to rapid tumor growth . The human genes hMSH3 and hMSH6 are homologous to the bacterial MutS gene whose products bind DNA mismatches to initiate strand-specific repair of DNA replication errors . Somatic and germline mutations in hMSH6 were associated with sporadic MMP+ colorectal carcinomas and HNPCC . We have found previously that the BLM gene may also be a target of MSI . The frameshifts, found in a short poly-adenine repeat, were predicted to generate a truncated and non-functional BLM protein. Homozygous or compound heterozygous mutations at the BLM gene were shown to cause the Bloom syndrome (BS; OMIM 210900), a pre-malignant condition characterized by chromosomal instability and increased mutational rate. BS patients are predisposed to a wide variety of neoplams diagnosed at early age. Noteworthy, among 100 neoplasms recorded in the BS registry, 19 were gastrointestinal (esophagus, stomach and colon) and only two were diagnosed after the age of 40 . These data indicate that mutations in the BLM gene can promote tumorigenesis. To better define the role of BLM in gastrointestinal tumorigenesis we screened a panel of MMP+ and MMP- gastric carcinomas (GCs) for: a) frameshifts in the BLM coding region microsatellite and b) for possible associations with other intragenic frameshifts. For the present study, our panel of 50 GCs contains 15 MMP+ tumors with MSI at two or more loci (Table 2) and 35 GCs MMP- with alteration at one microsatellite (4 tumors) or without MSI (31 tumors). All the MMP+ cases were BAT 26 positive, and BAT 25 instability was found in 13 out of 15 cases (except cases 67R and 27P). The clinico-pathological features of MMP+ tumors are described in Table 1. The MMP+ phenotype was closely associated with a low pTNM stage and with a less prevalent nodal metastases (p = 0.02 and p = 0.001 at Fisher exact test, respectively, vs. MMP-tumors). Within the MMP+ group, an excess of tumors in early stages and without lymph node metastasis was found (10/15 cases vs. 10/32 cases of MMP- cases, p = 0.02 and 11/15 cases vs. 7/32 cases of MMP- cases, p = 0.001, respectively), data that support the proposed better prognostic of GCs MMP+ [33, 34]. Of note, no excess of intestinal type among MMP+ tumors was found (12/15 cases vs. 20/32 of MMP- cases) (Table 1), data in accordance with recent studies showing no significant difference in the frequency of MSI in intestinal-type and diffuse-type carcinomas [26, 35]. Status of the coding microsatellites within BLM, WRN, RECQL, CBL, hMSH6, hMSH3,IGFIIR,TGF-βRII and BAX genes in the series of gastric carcinomas with microsatellite mutator phenotype. PCR amplification of the BLM microsatellite revealed abnormal bands, absent in the normal matched DNAs, in 4 of the 15 MMP+ tumors (27%) (Fig. 1). We have confirmed by sequencing that the abnormal bands are caused by a deletion of one adenine residue in the poly-adenine tract (reduction from nine to eight adenines), as previously shown . The mutation frequency in BLM may be a low estimate, because we have excluded cases in which abnormal bands in tumor DNAs were notably weaker than the normal ones, possibly in consequence of a large contamination of tumor with nonmalignant cells or of a low portion of malignant cells displaying the abnormality (Fig. 1). Since no BLM mutation was seen in MMP- tumors, frameshift mutations in the BLM gene appear to be specifically associated with gastric MMP+ tumors (probability P < 0.01 at Fisher exact test), similar to the previous well-documented alterations in TGFβ1-RII, IGFIIR, hMSH3, hMSH6 and BAX genes [14, 16, 17, 32]. Therefore, our data expand the repertoire of altered genes associated with MMP+ gastric carcinomas. Representative examples of mutations detected in microsatellites at gene coding regions. Case numbers are shown above each matching normal (N) and tumor (T) DNA pairs. Arrows indicate the abnormal bands. Note that we have not considered mutated samples where abnormal bands were very faint (like in the BLM and BAX genes of tumor sample 30P). Because of the tendency of Taq polymerase to add an extra nucleotide at the end of the synthesized DNA fragments, PCR products appear sometimes as double bands. With the exception of BAX frameshift in tumor 69R, no other mutation appears to be homozygous. However, by knowing the ratio of malignant cells in tumor sample, we have previously indicated that the BLM mutation in tumor 69R is also homozygous . The same panel of MMP+ tumors was also analyzed for the presence of frameshifts in microsatellites located in the coding regions of eight other genes (Table 2). We have found variation in sequence length in TGFβ1-RII, IGFIIR, hMSH3, hMSH6 and BAX genes, all previously reported to be altered in MMP+ GCs. Data about the TGFβ1-RII status for eight (P series in Table 2) of the fifteen tumors were previously reported . The observed mutation frequencies were comparable with those previously reported for all these genes, with the exception of IGFIIR, for which we found a low percentage of frameshifts (Table 2). Interestingly, in comparison with BLM mutations, only TGFβ1-RII frameshifts were more frequent (60% vs. 27%, respectively) and BAX frameshifts were as well as frequent (27%). These data suggest that frameshifts in BLM are common alterations in MMP+ GCs. A trend toward an association between mutations in BLM and mutations in BAX and hMSH3 and/or hMSH6 was observed (Table 2) (P = 0,05 at Fisher exact test). We have also analyzed the RecQL, WRN and CBL genes, which contain short repeats in their coding regions. The first two genes are members of the same helicase gene family as BLM[36, 37]. While RecQL is not associated with any human disease, mutations in the WRN gene are cause of the Werner syndrome (WS; OMIM 277700), a rare autosomal recessive disorder clinically characterized by premature aging and increased risk for a variety of neoplasms, and genetically characterized by genomic instability. CBL is a tyrosine kinase receptor , whose deregulation was associated with oncogenesis . We have found mutations only in the CBL gene (Fig. 1). 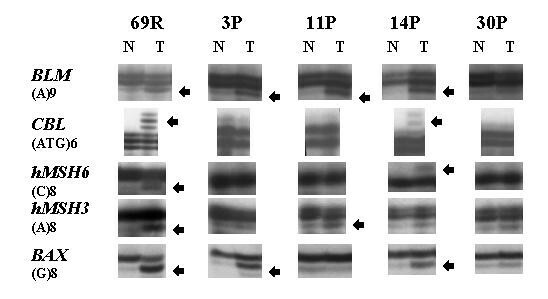 Two samples (69R and 14P) were found to carry a 3 bp insertion in the trinucleotide (ATG)6 repeat of the CBL gene (data not shown). As we have previously reported , since no frameshift is produced, no functional consequence can be inferred. Both mutations were found in cancers displaying also BLM frameshifts (Table 2). It is noteworthy that this subset of tumors show a statistically significant excess of MSI in coding regions when compared with the MMP+ subset without BLM alterations (P < 0.001, at Χ2 test) (Table 2). Several studies have documented that alternative pathways may exist in gastrointestinal MMP+ and MMP- cancers characterized by different sets of altered genes . A gradual model of mutator mutations ("the mutator that mutates the other mutator") was proposed to define the mutator versus the suppressor pathways in gastrointestinal tumors . By analyzing the timing of mutational events in genetically unstable GCs, it was proposed that the first targets of mismatch repair deficiency are the mononucleotide tracts of TGFβ1-RII and BAX. The frameshift mutations of hMSH3 and hMSH6 appear to be secondary mismatch repair lesions, which generate mutations in IGFIIR. The finding that frameshift mutations at TGFβ1-RII are the most frequent and the IGFIIR are the less frequent in gastric MMP+ tumors supports to the model in which early events should be present in the majority of tumors and late mutations only in a minor fraction . This finding is also confirmed in our study (Table 2). BLM frameshift mutations are associated more frequently with first and second step alterations proposed in this model, suggesting that they are secondary to mismatch repair defects (in hMSH3 and/or hMSH6) present in cells which do not undergo apoptosis (possibly in consequence of BAX inactivation). Noteworthy, in case 3P, in addition to BLM, the only frameshifts were found in BAX (see figure 1) and p53 (data not shown) genes, suggesting that, in some instances, BLM alteration may occur without hMSH3 and/or hMSH6 mutations, in cells with abnormal p53-mediated pathway of apoptotic response to DNA mismatch. The involvement of BLM in tumorigenesis outside BS patients seems conceivable, since this gene appears to act as a caretaker. BLM mutations are known to cause an increased genomic instability characterized by an elevated number of chromosomal breaks, gaps and rearrangements and by an excessive number of mutations in both coding and noncoding regions, likely originated by unequal sister-chromatid exchange, characteristic feature of the Bloom syndrome [44, 45]. Accordingly, BS exhibits a combination of genomic instability and elevated cancer risk, an association found also in other diseases caused by defects in caretaker genes (such as HNPCC, WS, ataxia-telangiectasia and xeroderma pigmentosum). Similar to the mutations found in BS, the frameshifts described in GCs abolish the helicase function of the BLM protein . BLM protein has a proven DNA unwinding activity  and could be involved in processes that are disturbed in malignant cells, such as DNA replication, recombination, chromosome segregation, DNA repair and transcription. Indeed, the fission yeast BLM gene homologue (radl2+/rqhl+) was shown to regulate the S-phase checkpoint and was proposed to couple chromosomal integrity with cell cycle progression [47, 48]. However, the finding of BLM mutations in MMP+ tumors generates a paradox: BLM mutations are predicted to generate chromosomal instability while most of the MMP+ tumors are diploid. Nevertheless, some MMP+ tumors are aneuploid and BLM loss-of-function mutations may have pleiotropic consequences, possibly affecting also the microsatellite instability pathway, as suggested by the description of an increased intra-gene mutations in Bloom syndrome [44, 45]. In suppoprt to our suggestion is the finding that we have found that BLM is mutated in LoVo cell line, a colon cancer cell line with both microsatellite and chromosomal inatability . Much more, it was recently reported that SGS1 gene, the Saccharomyces cerevisiae homologue of BLM and WRN, suppresses genome instability and homeologous recombination and is redundant with DNA mismatch repair (MMR) for suppressing gross chromosomal rearrangements and for suppressing recombination between divergent DNA sequences . Our results indicate that BLM frameshifts are frequent alterations in GCs and are specifically associated with MMP+ tumors displaying at least 2 unstable microsatellites. Mutations in BLM appear to be frequently associated with frameshifts in BAX and in hMSH6 and/or hMSH3, and tumors with BLM alterations present a number of unstable mono- and trinucleotide repeats located in coding regions significantly higher than that observed in MMP+ tumors without BLM frameshifts. We suggest that BLM loss of function by MSI in gastric tumors is an intermediate mutational event, which may increase the instability of a pre-existent unstable genotype. Fifty primary gastric tumors and their normal paired tissues (blood or normal gastric mucosa) were selected on the basis of available DNA from a panel of 80 gastric tumors (27, Calin G and Negrini M unpublished data). When possible, areas of tumor tissue with minimal inflammatory cells or minimal stroma, or both, were selected to obtain a neoplastic cell load greater than 50%. All cases were identified histopathologically as adenocarcinomas. Histotype (according to Lauren's classification)  and staging (according to the TNM classification)  was known for 47 out of 50 cases (94%) (Table 1). Thirty-two cases were of intestinal histotype and 15 cases of diffuse or mixed type. Twenty tumors were staged I or II, while 27 were in stage III or IV. Regarding the lymph node status, eighteen cases were NO and 29 were N-positive. None of the patients had developed a cancer at an early age, and none had a family history suggestive of genetic predisposition to cancer. High molecular weight DNAs was isolated using established procedures . MSI was revealed with two sets of anonymous markers at loci: (i) D11S1778, D11S1328, D11S922 and D11S1318 or (ii) D2S177, D3S1076, D5S433, D11S904, D17S796 and D18S59. The primers for these dinucleotide microsatellite loci were obtained from information available through the Genome DataBase. PCR amplifications were carried out as previously described [24, 27]. For all samples the BAT25 and BAT26 microsatellites were analyzed by PCR amplification as described . MSI was assessed if a mobility shift of PCR products from tumor DNA compared with the normal counterpart was identified. Only tumors with at least 2 MSI (>30% of tested microsatellites) were considered MMP+. The (A)9 microsatellite located at position 1610–1618 of BLM cDNA sequence was analyzed for all paired samples. Briefly, the microsatellite was amplified by PCR using 50 ng of template DNA, 1 μM of each primer, 1.5 mM of MgC12, 50 μM each of dATP, dGTP, and dTTP and 5.0 μM of dCTP, 0.1 unit of Taq DNA polymerase, and 1 μCi [α33P]dCTP in 10 μl of reaction volume. PCR reactions were carried out for one cycle of 94°C for 5 min followed by 35 cycles of 94°C for 30 s, 60°C for 30 s and 72°C for 30 s. PCR products from tumor and corresponding control DNAs were loaded on parallel on 6% acrylamide sequencing gels and exposed for visualization by autoradiography on Kodak X-AR films. Detection of mutations in microsatellites located in the CDRs from eight other genes (the (A)10 in TGFβ1-RII, the (G)8 in IGFIIR, the (G)8 in BAX, the (A)8 in hMSH3, the (C)8 in hMSH6, the (A)9 in RecQL, the (A)8 in WRN, and the (ATG)6 in CBL) was done as previously described [14, 16, 17, 24, 32]. For verification, each PCR was repeated at least twice. A mutated allele was represented by a band shift of 1 to 3 bp from the normal band with intensity comparable or greater than that of the wild-type band (Fig. 1). Genomic DNA fragments exhibiting band shifts were reamplified under the same conditions except for the omission of labeled dCTP. Before sequencing, the PCR products were purified either directly or after separation in a 2% agarose gel, using Qiagen purification kits. Both DNA strands were sequenced using PCR primers and an automated Applied Biosystem 377 sequencing station. Nucleotide sequences were analyzed using the Wisconsin (GCG) program package version Unix-8.1. The statistical analysis of results was performed using the Χ2 test or Fisher's exact test. A P value of <0.05 was considered statistically significant. This work was supported by grants from the Associazione Italiana per la Ricerca sul Cancro (AIRC) and partly from the EC BIOMED contract BMH4-CT95-0914. GC was supported by an IARC Research Training Fellowship.